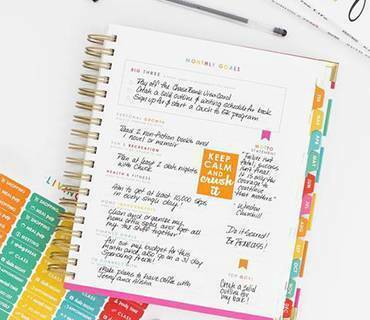 Now you can add months to your planner! If 12 months are not enough, or your school year or anything else doesn’t end during this year, you can overtake your planner adding six more months. Set to expand your planner up to six months. - 6 months divided into weeks without date. - 2 sticker sheets with months and numbers to help you customise your pages. You may add, remove or enlarge your Create 365 planner. Me and my big ideas’ new agendas are here. We are talking about Create 365 The Happy planner. These planners or agendas will help you day after day to remember your appointments, your tasks and your pending work, but also to fill it in with pictures, decoupage to transform it into a souvenir reminder of your daily moments, your trips or your most special moments. Dimensions of a page: 17,9x11,8 cm.